This free, city-wide arts festival, sponsored in part by the city, the province and Canadian Heritage, sees over 400 artist’s work showcased in 28 sites housing 44 exhibitions. 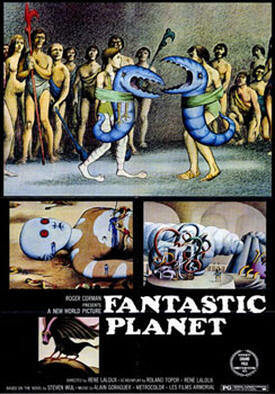 -The film Fantastic Planet (Click HERE for more on the 1973 Sci-Fi film). -Japanese director Hiroshi Teshigahara’s brilliant documentary on Catalan architect Antonio Gaudi in the Citadel Theatre complex Click HERE to watch some of the film. -A celebration of Quebec’s 400th anniversary, with French entertainment. I recently saw the Gaudi film and recommend it, too. It’s less a documentary than a poem captured on film, though there is almost no dialogue. It might sound kind of dry to sit through, but Gaudi’s buildings (and the way the camera glides over them) combined with the spare, otherworldly soundtrack makes the film very hypnotic.